Perfect. Peaceful. Pleasant. Placid. Lake Placid, that is! When searching for a much-needed break from errand running or filing TPS Reports, we turned upwards – errrr, upstate in New York. Lake Placid is a charming village with historic significance, as well as the two-time host of the Olympic winter games. 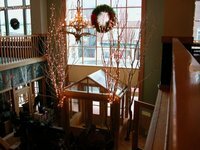 We also proclaim it a significant event when you make your Adirondack escape to any of our Top 10 Lake Placid Resorts. We’re certain that after relaxing lakeside or mountainside at one of our picks, you’ll feel completely refreshed, rejuvenated and ready to scale the rigorous mountain that we call life. Mirror, mirror on the wall, who is the fairest NY lakeside resort of them all? While we’re not claiming to possess all-knowing powers, we will assert that our No. 1 pick on the shores of Mirror Lake has a good chance of being that magical mirror’s answer. 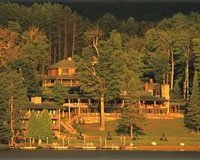 Mirror Lake Inn Resort and Spa – a recipient of AAA’s Four-Diamond award for 25 consecutive years – had its humble beginnings as an 1883 estate. It was opened to the public in 1924, and what has blossomed since is a luxurious Adirondack retreat. If you came for the view, you’ll get double what you asked for! First is the view of the rugged mountains reflected in the appropriately named Mirror Lake. Second, is The View restaurant, an award-winning fine dining venue. Whether it’s the chilled lobster salad, roasted rack of lamb or pumpkin mousse, it’s an exceptional experience for the eyes and stomach. After climbing Pitchoff Mountain, taking a family canoe trip on a stillwater river or an evening hike up Cobble Hill, you’ll look forward to your Mirror Lake Inn guestroom. Blending the characteristic outdoor wilderness with elegance produces rooms with sturdy wooden furniture, a fireplace and a balcony with a view. Bring the company to Mirror Lake Inn and Spa for a team-building weekend. Hold a curling tournament, scavenger hunt or ice climbing adventure. From Rochester, NY and points West, take I-90 east to Exit 36 for Syracuse. Then take I-81 north and follow into Watertown. Take Route 3 into Saranac Lake and then follow Route 86 east. Route 86 takes you into Lake Placid. At the bottom of the hill (where High Peaks Hotel is on your right), take a left. Mirror Lake Inn and Spa will be on the lefthand side. After that day kayaking, golfing or just exploring Mirror Lake and the Adirondacks, make an appointment at Mirror Lake Inn Spa. Indulge in the Adirondack Maple Sugar Body Scrub, which uses local maple sugar for a full body exfoliation. Finishing in the Vichy Shower leaves your skin smooth and hydrated. Our No. 2 resort is bedecked in all sorts of colors – blue for the sparkling waters of Mirror Lake, cinnamon for the peaks of the Adirondack Mountains, white for the stretch of private sand beach and green for the four leaf status in the Audubon Societies eco-friendly resorts program. It’s also gold, not only for the golden memories you’ll make, but for its name: Golden Arrow Lakeside Resort. In the center of Olympic Village, Golden Arrow puts you in the heart of Lake Placid activity. Catch a cup of coffee on Main Street after a day browsing the Glass Blowing Shop or picking up a treat at GooseWatch Winery. Commandeer a complimentary rowboat, canoe or paddleboat. Motorized watercrafts are not allowed on Mirror Lake, so wake up, paddle out to the middle of the lake and watch the sun rise. In the winter, use the frozen Mirror Lake as an ice skating rink. Or, trade the skates for sleds and take a thrilling dog sled ride! Avid cross country skiers on the first floor enjoy the benefits of ski in/ski out lodging and anyone can relax with a deep tissue massage in the privacy of their own room. Take a daytime, sunset or romantic candlelit tour for two of Mirror Lake and the Village in a wooden gondola that was handcrafted in Italy. Golden Arrow’s beach is actually made of crushed limestone. The limestone balances Mirror Lake’s PH levels, which counteracts the effects of acid rain. Inside Golden Arrow’s doors lies a heated pool, two whirlpools, steam baths, a sauna, health club and game room with darts, foosball, ping pong and a pool table. When thinking of memories associated with “Great Camps,” we’re sure what comes to mind are those nights in a cramped tent with all your friends after a sweaty day hiking and a night roasting marshmallows. As dear as these memories are, we’re inclined to reach for our Great Camp-inspired No. 3 spot. The Whiteface Lodge was built by a former Olympian who carried the vision of a grand Adirondack lodge with modern luxury. Made from timber that was hand-milled on site and appointed with handcrafted furniture, the mountain ambiance is upheld. Amenities at Whiteface Lodge also retain the balance of rustic and refined. On the private beach, you’ll find canoes, kayaks, volleyball, croquet, bocce ball, badminton and horseshoes at your disposal. Bad weather outside doesn’t alter the entertainment inside, which includes a surround-sound theater, 10-pin bowling alley, family game room and indoor heated swimming pool. After a day with all those Adirondack activities, you need KANU. The onsite restaurant specializes in innovative American cuisine and uses fresh local and organic ingredients, fish and game. What’s not on the menu, but definitely a specialty at Whiteface, is your lavish suite with Jacuzzi tub, heated bathroom floor and private balcony or porch. Relax as a pair with The Whiteface Spa’s French Lavender Sea Bath and Massage Ritual for couples. Whiteface Lodge is located on the edge of Lake Placid, moments from urban activity but still secluded in the Adirondack Mountains. Whiteface is also the only luxury resort in the region that offers private jet service to its guests. The Whiteface Lodge is an ideal Adirondack family reunion destination. Whiteface will help plan the gathering with activities like private dining at KANU, a slideshow in the surround-sound theater, family bonfires on the beach and more! Don’t settle for silver medal service when you can be pampered with gold medal, first-rate lodging and amenities at our No. 5 resort in historic Lake Placid, site of the 1932 and 1980 winter Olympic games. Northwoods Inn, aptly named for the acres of surrounding Adirondack forests, is a historic Lake Placid adventure, inside and out. Cozy rooms sport views of High Peaks and Mirror Lake while the bustle of The Village carries on beneath your window. Recline on the Tempur-Pedic “Weightless Sleep” mattresses, which contour to your body to ease the muscles and the mind into a tranquil afternoon nap or night of uninterrupted slumber. If you’re itching for some nightlife before officially turning out the lights, join in Noah John’s campfire with live Adirondack music. Northwoods Inn’s location is your ticket to an Olympic dreamland. Make your own Olympic history on an Olympic bobsled ride, the 32 miles of world-class cross country ski trails or improve your marksmanship on targets used by winter biathletes for World Cup competitions – all this and more at the Olympic Sports Complex at Mount Van Hoevenberg. Test your skiing skills on the Little Whiteface vertical drop of 2,500 ft. on Whiteface Mountain. The Northwoods Inn was originally named Hotel Marcy – after Mount Marcy – and was founded in 1926 by Frank Swift. He wanted to build a modern, fireproof and grand scale hotel for high profile guests. Start with breakfast at The Pavilion, come back to a steak dinner at Northern Exposure and end your day with a drink by the fire at The Cabin, each on site at The Northwoods Inn. Our journey to find the pinnacle of Lake Placid resorts inevitably led us to our No. 9 spot, Lake Placid Summit Hotel. It’s no simple feat upholding the peak of comfort and style, but Lake Placid Summit only asks that you relax as they scale these heights for you. A far cry from a crowded hotel, Lake Placid Summit brings you three floors of standard guestrooms and luxury suites. Gaze out your window at the views of Mirror Lake and the village of Lake Placid, framed by gold curtains. Or, relax in your whirlpool tub and feel the jets soothe and relax the muscles you used on the slopes. If the bathwater cools too quickly, head downstairs to the indoor hot tub. The pool deck is just around the corner for summertime sunbathing and a breathtaking mountain background. When it’s finally time to enter the world’s bustle again, head into Lake Placid for summer ice shows, the Lake Placid film festival, Oktoberfest at Whiteface Mountain, hockey or golf tournaments. With so much to explore, you better get started! From Montreal, take Route 15 South to Champlain Crossing. It will connect with Adirondack Northway/I-87 South. Take Exit 34 west and follow Route 9 north. Take Route 86 to Jay/Wilmington/Lake Placid. Follow Main Street to Saranac Avenue. The Lake Placid Summit Hotel is on the hill on the right-hand side. Some rooms at Lake Placid Summit Hotel are pet-friendly! In your Lake Placid Summit Hotel room you will find cable TV, ice maker, individual climate control, radio, bath toiletries and more. Getting a fabulous view from your resort room’s window is always appreciated, but more important is easy access to that view. Luckily, our No. 10 Lake Placid pick wholly embraces the importance of location. Situated on the shores of Lake Placid, Wildwood on the Lake boasts NY accommodations as idyllic as its name. Round up the extended family for an Adirondacks reunion and stay in one of Wildwood’s cottages. Steps away from the water’s edge – one cottage even has a rocky slope with a cascading waterfall – these quaint lake houses embrace you after a day of swimming and boating and push you back out the next day for more Main Street expeditions or Adirondack hikes. Though the Poolside Units may not be the full-fledged house rental you can indulge in at Wildwood, it does put us next to an aquatic attraction we treasure: the heated indoor pool. Plus, packages that go easy on your NY vacation budget give no room for hesitation when booking a stay at Wildwood over Christmas, New Years, Memorial Day, Labor Day and more! Swim in the outdoor spring-fed pool, have a picnic lunch by the lake or a family barbeque dinner. From New York City and New Jersey, take I-87 North to the Adirondack Northway/Exit 24 in Albany. Follow 87 to Exit 30. Then take Route 9 north for two miles to Route 73. Stay on 73 for another 28 miles. Take the first left at the traffic light in Lake Placid onto Route 86. Wildwood on the Lake will be on your right. For that large family reunion, there’s the three-bedroom Charming Village Home. Enjoy the tranquility of a residential neighborhood while still being close to free boats and the pool back at the resort. A cross between a castle and a cabin, our No. 7 pick serves classic made-to-order breakfast and afternoon tea while simultaneously bringing out the natural beauty of the Adirondacks with bed frames of solid tree branches, a large stone fireplace and views of Whiteface Mountain. Winter is possibly the most romantic time for a stay at Lake Placid Lodge. Though Lake Placid itself is a frozen sheet of glass, the surrounding forest is peacefully hushed by the blanket of snow. Hike through the trees on snowshoes or take an exhilarating plunge on the longest vertical drop of an Eastern ski mountain. The 3,430-ft. downhill skiing drop on Whiteface Mountain is sure to get your heart pumping! Bundle up and ice fish on St. Regis Lake or Colby Lake. Or, come down for a bonfire with s’mores and hot chocolate. In the warmer months, take a dip in the spring-fed waters of Lake Placid, sign up for a Champagne Cruise or fish for bass, perch, lake trout and rainbow trout. Other adrenaline-inducing outdoor fun includes whitewater rafting, horseback riding, rock climbing, mountain biking and more. If your explorer’s curiosity takes you off site, visit the Olympic Center and Museum to re-live the glory of the 1980 “Miracle on Ice” that occurred at Lake Placid’s Olympic Center. The Algonquin Indians were called Adirondacks – “bark eaters” – by the Mohawk Indians because the Algonquin survived on trees in the winter. Nothing is quite as satisfying at the end of the day as a brew by the fire at Maggie’s Pub or a romantic dinner in the wine cellar at Artisans. When you're on vacation in Lake Placid, why should you have to settle for less than the very best? Our No. 8 resort brings you luxurious lodging at a price you can be happy about. The Courtyard by Marriott Lake Placid features excellent amenities and uniquely comfortable accommodations near Whiteface Mountain. You'll be conveniently close to all of Lake Placid's best attractions and activities, but you won't have to leave the hotel to have a good time. Enjoy the cocktail lounge, swimming pool, double hot tubs, and exercise room! Start everyday of your vacation off right with a delicious hot breakfast buffet before heading out for golf, skiing, and sightseeing. When you return, you'll be welcomed home by spacious guest rooms with luxurious bedding, flat screen TVs with cable, and bathrooms with jacuzzi tubs. Each room is thoughtfully designed to give you everything you're looking for in affordable lodging! The Courtyard by Marriott Lake Placid combines comfort, convenience and excellence in service to enhance your stay! Looking to host a meeting? This hotel offers a 500 square foot meeting facility equipped with high-speed Internet access, a television and projection screen for effective presentations. The hotel also offers full catering services and customizable menus! From the hotel you can take a trolley service to Whiteface Mountain during ski season. Check out the resort's excellent golf, romance, and breakfast packages! 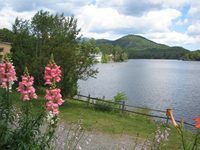 Lake Placid Vacation Homes is bursting with Adirondack adventures! With the area's finest selection of rentals and stunning natural scenery, you're sure to love this unique utopia. Sit back and relax in your luxurious lodging or go out and explore the New York wilderness! Redefine the vacation rental experience with an impressive selection of lodging options that include waterfront rentals, luxury vacation rentals, condos, townhouses, village rentals, and Whiteface Lodge accommodations. Soak in the natural scenery while enjoying modern amenities like Jacuzzi tubs, sparkling pools, tennis courts, and more. Warm up by the elegant fireplace, curl up on the deck, or have a ball in the game room. When you're ready to explore, step outside and enjoy a diverse array of activities. Mirror Lake and Upper Saranac Lake provide aquatic adventures like fishing, swimming, and boating. If you'd prefer to stay on land, hike the lush nature trails or head to the mountains for sensational skiing. After all, there's a reason they held the Winter Olympics in this exceptional environment. And, a village rental means that you're within walking distance of Main Street, buzzing shops, and exceptional restaurants! Shred the slopes of Whiteface Mountain just as the Olympians did before you. Whether you're a novice or a seasoned veteran, Whiteface Mountain has a variety of runs that prove both fun and challenging to any skier or snowboarder. Reconnect with nature in the diverse Lake Placid landscape. Whether it's hiking the area's many trails, paddling or boating on Mirror Lake, or skiing, the possibilities are seemingly endless! If you’ve been looking for that perfect family-friendly Adirondack vacation, look no further. Our No. 10 Lake Placid Resort has got it covered for hesitant moms and dads. Your kids will be begging to make High Peaks resort a second family home. Deeming themselves a casually elegant resort, we couldn’t think of a better blend for the family – casual enough that you don’t have to keep the kiddies on a leash, but elegant enough to suit parents in desperate need of a vacation. Take the entire gang on a High Falls Gorge Adventure. Discover the beauty of Ausable River’s waters flowing over granite cliffs – and kids under four are free! Or, perhaps a more appropriate word for your bundle of joy’s energy is also the appropriate title for your next destination: The Wild Center. Harnessing the wild animals of the Adirondack outdoors, you can meet otters, fish, birds and more in these phenomenal exhibits. After tucking the kids into bed, parents take a time out – for two, that is. Return to your European-style bathroom with natural stone tile floors and rainfall showerheads. Snuggle under the high-thread-count linens and watch something besides cartoons on the flat screen TV. Spared the drudgery of dinner-making, let Dancing Bears cater to the family’s taste. Delicious meals are served amidst painting of dancing bears and pictures of past Olympic champions that have chosen to relax in this Main Street restaurant and bar. From Ottawa, take a southern route to the Cornwall Bridge. Then take Route 37 East to Malone. Continue on Route 30 South to Paul Smiths and then take Route 86. Follow Route 86 through Saranac Lake to Lake Placid. Total trip should take about two and a half hours. Get the complete Lake Placid experience with your High Peaks room amenities like Molton Brown of London bath amenities, organic cotton terry robes, Allegro brand organic coffee and coffee maker, granite finishes and surfaces throughout the room and more.